The last Friday of every month, our cinema afternoons are free for anyone to come along to. 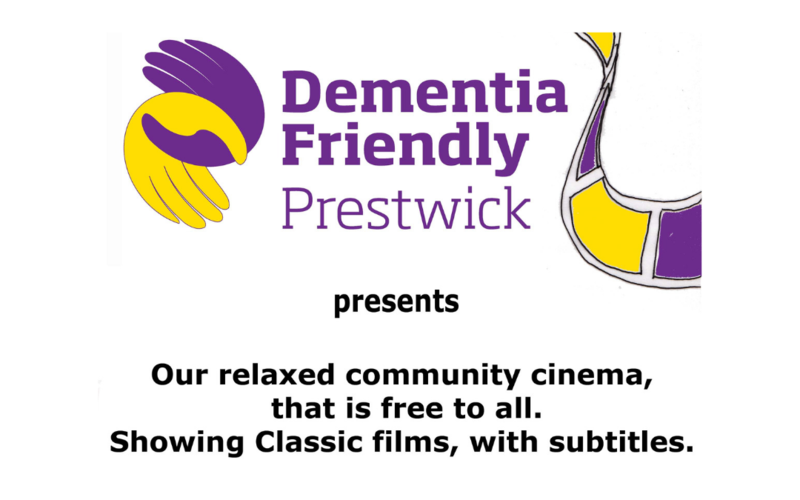 All of our volunteers have had our dementia awareness training, the venue is accessible, and we show all of our films with subtitles – these are events for everyone to enjoy. We want people to feel relaxed when they are with us. 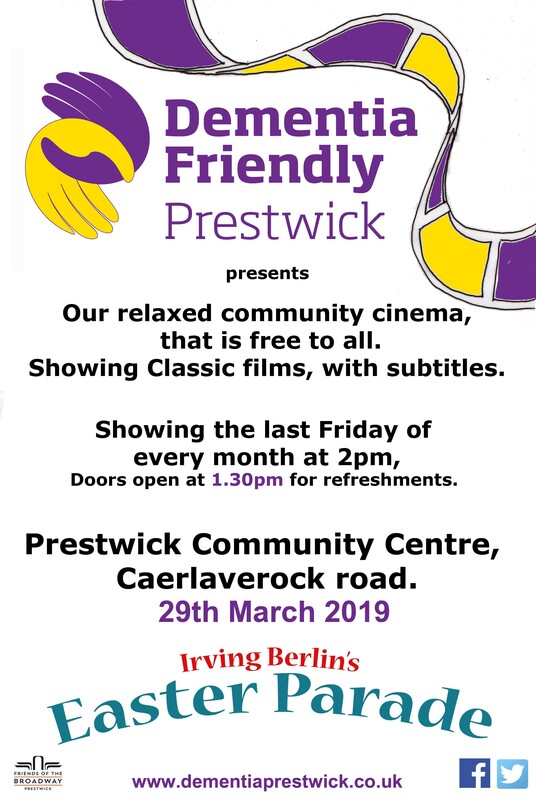 We serve refreshments throughout the afternoon, given to us by Sainsbury’s and Berelands House – doors open at 1:30pm, and the films start at 2pm. A “relaxed screening” means that it’s OK to make a little bit of noise when the film is on, no one will shush you. The room isn’t as dark as a traditional cinema space, and the film isn’t quite as loud. If you need to stretch your legs or have a break from the film, that’s fine and you can take a seat in the room next door for a while. We can refill your cups of tea and coffee throughout, and – perhaps most importantly of all – we have a short intermission when we hand out choc ices for everyone. Our ice cream usherette tray is an original artefact from Prestwick’s once-grand Broadway cinema. We fund raise to cover all the costs involved, and to ensure the afternoon is free for everyone. This is our happiest day of the month, it’s very popular, and we’d welcome you to join us. We have some super films coming up, the next one sees us celebrate Easter (a little early, 29th of March) with Judy Garland and Fred Astaire – Easter Parade.